Magnet toys are fun and innovative, and they are available for children of almost any age. From young kids learning about shapes to teens who want to create unique poetry, there is a magnet kit perfect for everyone. Preschoolers and younger elementary students need chunky magnetic toys that are perfect for little fingers. They also need fun toys that capture the imagination with bright colors, animals, exciting shapes, or other age-appropriate themes. Consider some of these fun options. Made by educational toy giant MindWare, Imaginets are great toys for encouraging visual perception and fine motor skills. They're also lots of fun. Each set comes in a wooden case that has a magnetic board on the inside of the lid. Kids can use dozens of brightly colored magnetic shapes to create designs inspired by the included cards, or simply make their own masterpieces. This toy is appropriate for kids aged three through eight. It retails for about $30 at the MindWare store. Younger elementary students and preschoolers can get in on the magnetic building fun with the Magneatos toy kit. The 30-piece set is made up of spheres and chunky rods of different lengths. 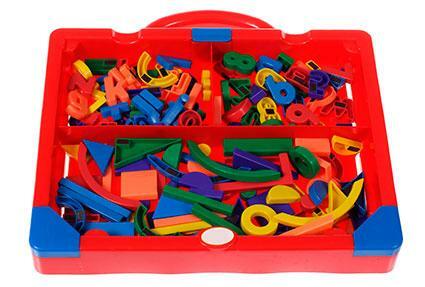 Kids can connect the bright red, green, yellow, and blue pieces to make three-dimensional structures. The strength of the magnets makes these creations quite sturdy, enabling hours of fun. The set is perfect for kids aged two through six and retails for about $45 from Fat Brain Toys. 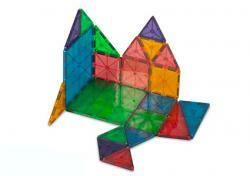 Preschoolers and early elementary kids who love to build will have a lot of fun with MagnaTiles. These geometric tiles come in solid and clear colors and have magnets embedded in the edges. 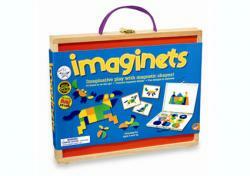 The magnets attract one another, allowing kids to build amazing three-dimensional creations. Prices vary depending on the number of tiles in each set, but a 32-piece kit retails for about $50 on the MagnaTiles website. Popular toy maker Melissa & Doug have a cute magnetic dress-up kit containing two dolls and lots of outfits and accessories they can share. 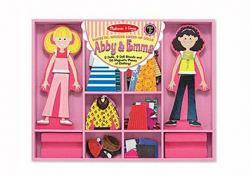 The kit also includes a stand for each doll, so kids can display them or use them for pretend play. The Abby and Emma Magnetic Dress-Up Set is ideal for kids between three and six years, and it retails for about $20 on Amazon.com. Older kids can also enjoy magnetic kits, especially if these toys challenge them and offer plenty of creative and scientific fun. Toys for this age group often have lots of small pieces, since older kids have the fine motor skills to manipulate tiny objects. Try out some of these exciting toys. Older kids can build amazing three-dimensional structures with the Goobi Magnetic Construction Sets. These sets, which include between 37 and 202 small magnetic pieces, are made up of tiny magnetic round balls, tripods, and connector bars. The brightly colored pieces work together to make just about anything, from a model of the Eiffel Tower to a dinosaur skeleton. The kits are appropriate for children aged six through ten and retail for between $16 and $70 on the Goobi website. 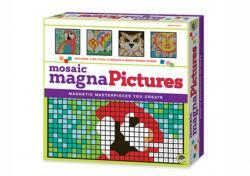 Another great toy from MindWare is Mosaic MagnaPictures. The kit includes a magnetic board and wooden easel, plus more than 2100 magnetic tiles. Kids can use the included templates to make mosaic designs, or they can exercise their creativity even more and create one-of-a-kind masterpieces. When they are finished displaying their work on the easel, they can take it down and make something new. This toy is appropriate for kids aged eight and up, and it retails for $25 on the MindWare website. Aimed at kids aged eight and up, the 4M Magnet Science Kit contains a large magnet and everything kids will require to create 10 different scientific experiments about magnetic fields. Kids can make everything from a fishing game to a magnetic race car as they learn about the science behind magnets. This set retails for about $17 on Amazon.com. 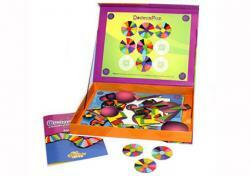 Craniatics is a kit that contains ten different magnetic games and puzzles for kids aged eight through twelve. Many of the games are single-player, but some can also be played by multiple people. Most games involve arranging and rearranging the brightly colored magnetic pieces to create different designs. This kit retails for about $25 from Fat Brain Toys. Little kids aren't the only ones who can enjoy magnet toys. Teens and tweens can also get creative and explore their worlds with these fun kits. 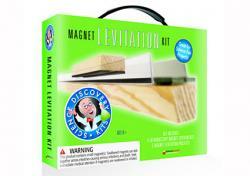 A Magnet Levitation Kit is fun for kids aged 10 and up. The kit includes dozens of magnetic components and a instruction book to help kids build an amazing magnetic levitating train. This toy helps illustrate scientific concepts like magnetic fields and equilibrium, and it's lots of fun too. It retails for about $30 from Fat Brain Toys. The ultimate creative magnetic toy for teens and tweens is the classic Magnetic Poetry Kit. Kids can make interesting and amusing verses by combining more than 300 words and fragments of words on any magnetic surface. The set comes packaged in a sturdy metal tin. It retails for about $15 on Amazon.com. 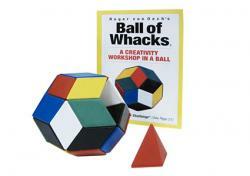 The Ball of Whacks is a magnetic kit that's ideal for teens who love three-dimensional puzzles. Recommended for ages 14 and up, this toy includes 30 tiny magnetic pyramids. Kids can use the kit to build all kinds of three-dimensional objects or challenge themselves to create the classic sphere. The set retails for $35 from the Creative Whack Company website. Magnetic toy kits can provide hours of fun for kids of all ages. Whether you're looking for the perfect preschool toy or finding something to keep your teen occupied, the perfect magnetic toy is out there.